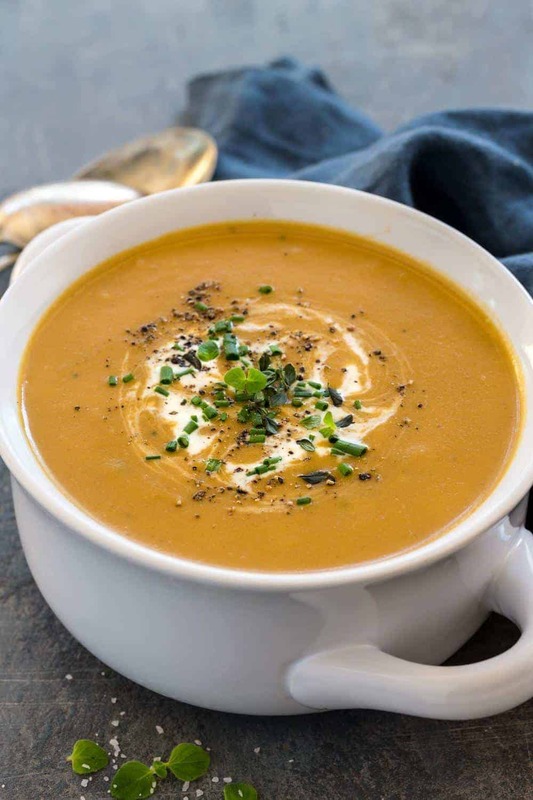 Slow Cooker Potato Leek Soup serves up a satisfying bowl of creamy pureed vegetables. The caramelized onions and leeks bump up the flavor as it gently simmers with the flaky potatoes and herbs. You won’t believe how easy it is to create a restaurant quality dish in the crock-pot! Hello! 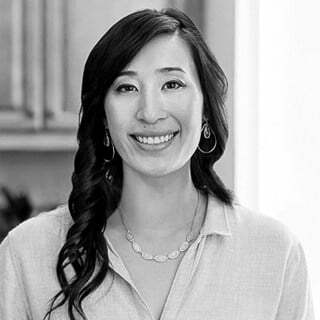 It’s Jessica Gavin, Certified Culinary Scientist, and I’m thrilled to share this easy slow cooker potato leek soup recipe with you. There is nothing better than coming home to a hot meal, especially as sweater-weather kicks in. The best part of this dish is it requires minimal effort. All it takes is three steps for the most creamy bowl of vegetable soup. Sauteeing the vegetables, simmer the potatoes, puree it all together, that’s it! Leeks are underrated and underused in daily cooking in my opinion. They pack a culinary punch with a combination of onion and garlic flavor, plus add a bit of sweetness as it cooks. However, at first glance, the stalky white plant with thick, inedible tops may seem tricky to prepare. Once you learn how to cut leeks, it’s a painless task, and you will be using it in all your recipes! A good potato leek soup starts with selecting the right type of potato. It’s what gives body and texture to the recipe. To keep the soup light yet creamy, I opt for Russets. They are starchy, which releases into the vegetable stock and helps naturally thicken the soup. They also have a crushable, fall-apart texture when cooked, making it a dream to puree with a blender. Leeks add a beautiful undertone of roasted garlic, savory onion, and slight caramel sweetness. It’s never eaten raw, yet once it’s cooked, the delicate flavors are coaxed out, and pungent flavors are tamed. A generous amount of thinly sliced white part of the leeks is used to add volume and maximum flavor to the pot. Make sure to always wash and check for dirt which can get trapped inside the layers of the vegetable. A little bit of cream adds just the right amount of richness to the soup. Along with the pureed leeks and potatoes, it provides a finishing touch right before serving for a velvety consistency. Aromatics like diced onion, minced garlic, thyme, and bay leaves intensify the smell of the soup. As you lift open the lid of the simmering vessel, the built up steam will deliver a lovely bouquet of appetizing scents. You won’t be able to wait to grab a spoon! Saute sliced onions and leeks until tender and very lightly browned. This process takes away any raw and harsh flavors before adding to the slow cooker. 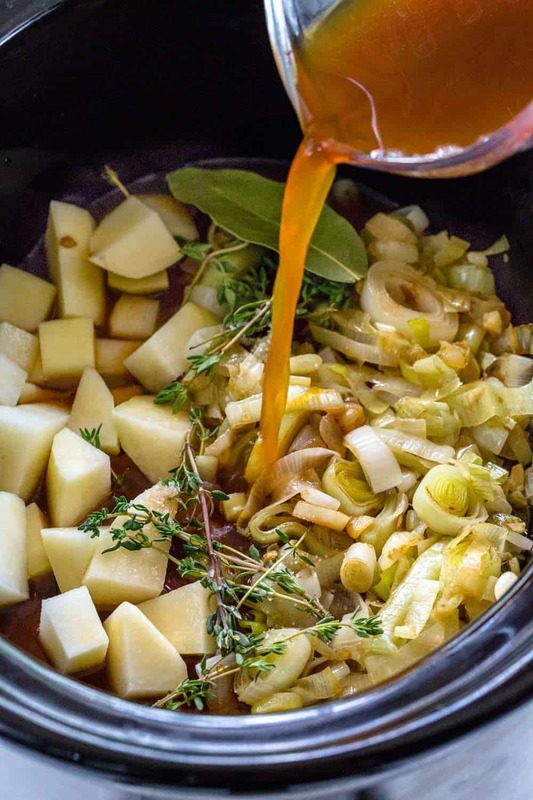 Simmer all of the vegetables, stock, and herbs in the slow cooker until the potatoes are tender. 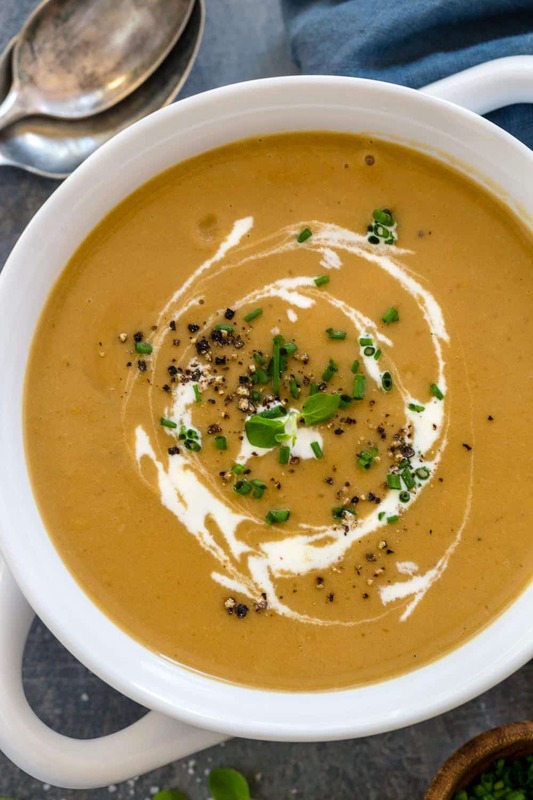 Use a hand immersion blender or kitchen blender to create a smooth and thickened soup. Whisk in the cream in at the end of cooking to prevent the dairy from curdling. Once you’ve got the ingredients in the pot, about 4 to 6 hours later you’re just moments away from dinnertime. All of the parts have had ample time to meld and infuse together, making each sip delectable. I like to add a drizzle of the cream on top, then sprinkle with tiny rings of chives to add freshness. If you’re looking for a quicker version or have an electric pressure cooker, give my Instant Pot potato leek soup a try, I know you will love it too! This recipe served with a few slices of crusty rustic bread makes for the ultimate comfort food. Serve up a warm bowl of slow cooker potato leek soup. Just saute the vegetables, simmer the potatoes, puree it all together, that’s it! Add butter and olive oil to the pan, once hot add the onions. Saute until fragrant, 2 minutes. Add the leeks and saute until softened, stirring frequently and very lightly browning, 5 to 7 minutes. Transfer sauteed vegetables to the slow cooker. Add potatoes, vegetable broth, salt, bay leaf, and thyme to the slow cooker. Place lid on slow cooker and cook on “High” setting for 4 to 6 hours or “Low” setting 6 to 8 hours, or until potatoes are fork tender. 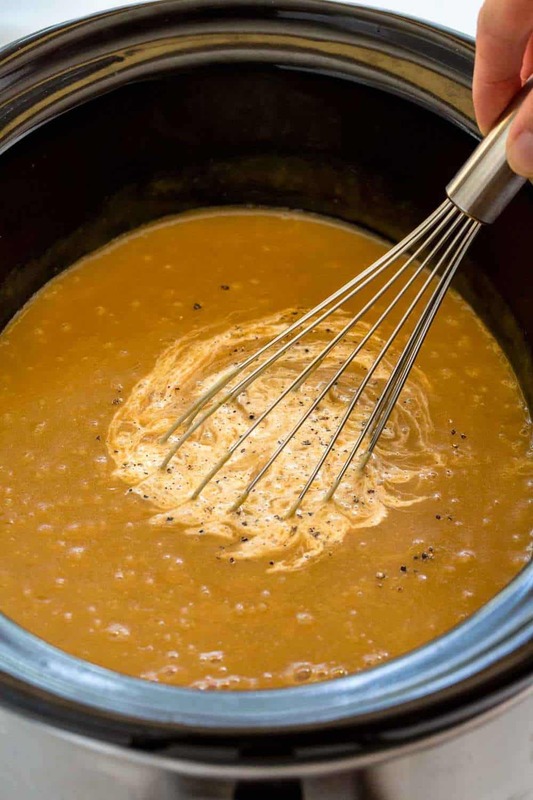 Use a hand immersion blender to puree the soup until just smooth, or transfer to a blender and puree. 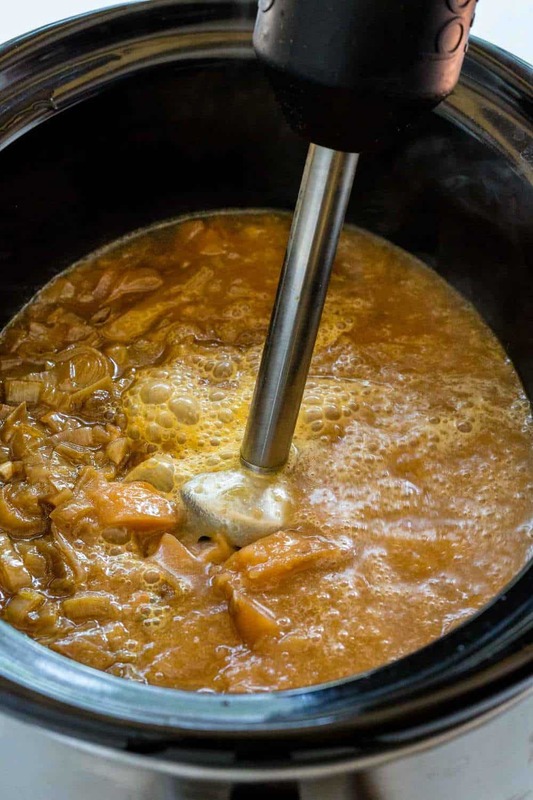 If soup is removed from the slow cooker, transfer back to the pot. Add in heavy cream and black pepper, whisk to combine. Garnish soup with a drizzle of cream and chives.